70 x 100 1/4 in. DC Moore Gallery is pleased to announce the opening of the exhibition, Janet Fish: Pinwheels and Poppies, offering a rare opportunity to view major works the artist produced from 1980 to 2008. 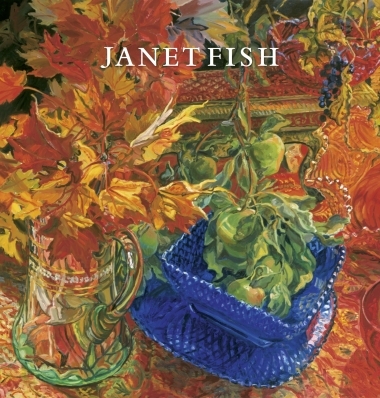 The title refers to the joie de vivre with which Fish revitalized the genre of still life painting in the years following her introduction to the New York art world in the late 1960s. Committed to an intense, expressive use of brushstrokes and the verisimilitude of objects, Fish’s paintings are filled with spirit, intensity, and irreverent wit. Her work exists in a state of flux, hovering in a space between fluid technique and measured stillness, where each object is animated by color and light. Graduating with an MFA from Yale in 1963, Fish was part of a group of artists that included Chuck Close, Richard Serra, Robert Mangold, Rackstraw Downes. Nancy Graves, Sylvia Plimack Mangold, and Brice Marden. Together they cultivated an intense and competitive cohort in which they were able to develop their diverse and individual practices. While at Yale, Fish studied under Alex Katz who encouraged her to explore landscape painting. As the works in this exhibition demonstrate, Fish has had an insatiable desire to explore settings and objects, always challenging herself in her work. DC Moore will also be exhibiting for the first time Carl Hunting (70 x 100 ¼ in), one of Fish’s largest paintings in which a solitary hunter silently waits amidst barren trees in early morning light. This quiet scene is given a stunning, palpable energy in Fish’s hand, where color delineates and activates the wild landscape. Janet Fish was born in Boston in 1938, but grew up in Bermuda, a vibrant place to which she attributes her own fascination with bright light and intense color. Fish attended Smith College and received her MFA from Yale University in 1963. She currently lives in New York City and rural Vermont. The landscape of Vermont and the garden she maintains there often figure prominently in her paintings. Recent exhibitions include solo shows at the Federal Reserve, Washington DC and her work was included in the Philadelphia Museum’s exhibition The Female Gaze: Women Artists Making Their World. Works by Janet Fish are included the permanent collections of over seventy-five institutions including, Albright-Knox Art Gallery, Buffalo, NY; Brooklyn Museum, NY; Cleveland Museum of Art, OH; Colby College Museum of Art, Waterville, ME; Detroit Institute of Arts, MI; The Metropolitan Museum of Art, New York, NY; Museum of Fine Arts, Boston, MA; National Gallery of Art, Washington, DC; Pennsylvania Academy of the Fine Arts, Philadelphia, PA; Smith College Museum of Art, Northampton, MA; Smithsonian American Art Museum, Washington, DC; Whitney Museum of American Art, New York, NY; and Yale University Art Gallery, New Haven, CT.
For press inquiries please contact Rachel Johnson at 212-247-2111 or at rjohnson@dcmooregallery.com.